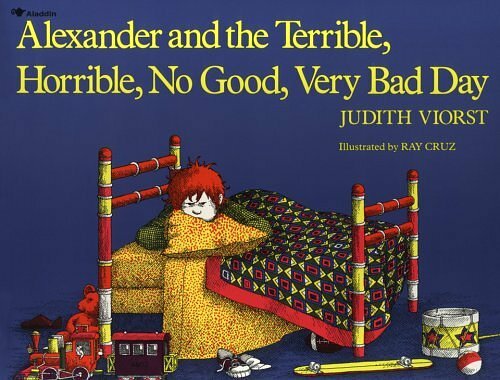 In her children’s book, Alexander and the Terrible, Horrible, No Good, Very Bad Day, author Judith Viorst writes about a boy named Alexander who’s having the worst day of his life. Everything that could go wrong does. I’m not unlike Alexander, who dreamed of escaping to Australia, where he thinks things will be better. Or Elijah, who told God he was ready to come home. I, too, long for a place of peace and rest, where there are no problems to deal with. Oh, to be sure, the enemy has tempted me to dwell on all the “terrible, horrible, no good, very bad” things that have occurred and give in to whining, hurtling myself into a pit of self-pity. But God tells me that focusing on the good things will give me the peace I long for (Philippians 4:8, 9). Psalm 46 is the prescription for the Alexander times in our lives: “God is our refuge and strength, an ever-present help in trouble. Therefore (I) will not fear . . .” (verses 1, 2). On a day no too long ago when I was feeling the stress of these Alexander times and not bearing up well, I received a handmade card from a friend. On the front were the words I needed that day: “Be still and know that I am God” (Psalm. 46:10). A couple of weeks ago I wrote about how I put on armor each day. What I forgot to mention is that, even with my armor on, my back is still vulnerable. You see, I can only fight a foe in front of me, and the enemy often strikes from behind—attacking at our weakest points. But I don’t have to worry: “For the LORD will go before (me), the God of Israel will be (my) rear guard” (Isaiah 52:12). And again: “The glory of the LORD will be (my) rear guard” (Isaiah 58:8). God’s got my back! Yes, it’s been an Alexander kind of year. But through it I’ve seen the power of prayer, I’ve sensed the presence of a God who knows me well and loves me still (Psalm 139). I’ve perceived there’s a purpose for the pain, even though I don’t see it or understand it. I’ve learned that in spite of everything, prayer brings a peace that transcends understanding (Philippians 4:6–7). And I’m getting better at Philippians 4:8 kind of thinking. I know beyond a shadow of a doubt that my God will never leave me or forsake me (Hebrews 13:5). “See,” He says, “I have engraved you on the palms of My hands” (Isaiah 49:16). Thank you, Father, for being with me in those “terrible, horrible, no good, very bad” times of my life, for helping me to see there’s a purpose for them, and for giving me Your peace in the midst of them. Amen. I don’t collect angels. They come to me. 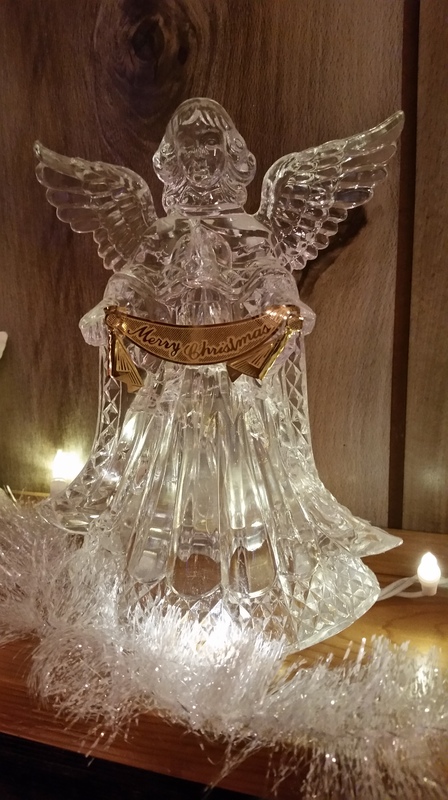 One of the first angels I received was a gift from my husband’s employer at a company Christmas party over 25 years ago. The “Satterlee angel,” as I came to call her, is a clear, lighted angel about 8 inches high, holding a golden banner reading “Merry Christmas.” A golden halo once perched above her head. I placed her where she could light up a dark section of the house. Winter days are often sunless and dreary. Nights are long and darker than any other time of the year. But my Satterlee angel reminds me that even in the longest, darkest, and coldest times of our lives, God sends us hope in the rays of His Son, which wrap themselves around us, warming the cold places in our hearts and spirits, lighting the darkest paths that stretch before us. My Satterlee angel represents HOPE. Then there’s my “Donora” angel. This angel is one of a pair that my late sister, Judi, had (Judi was the one who gave her the name “Donora angel.”) We grew up in that steel mill town in the heart of the Mon Valley. My niece sent her to me the Christmas following my sister’s sudden death in August 2003. 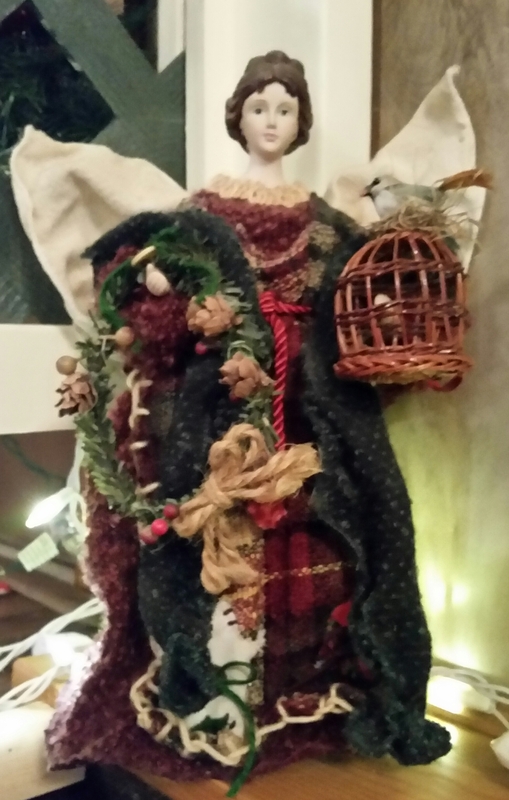 My Donora angel is a little over 12 inches high, dressed warmly in a burgundy winter gown with a Christmas-colored plaid apron, red cord belt, and a dark blue shawl. Her beige linen wings fan out behind her tranquil face. Over one arm is draped a Christmas wreath. In her hand she holds an empty birdcage, with a bird perched on top. My Donora angel reminds me of a past rich with family and traditions and people who helped to mold me into what I am today. People who knew me raw and still believed in me. My Donora angel represents LOVE. 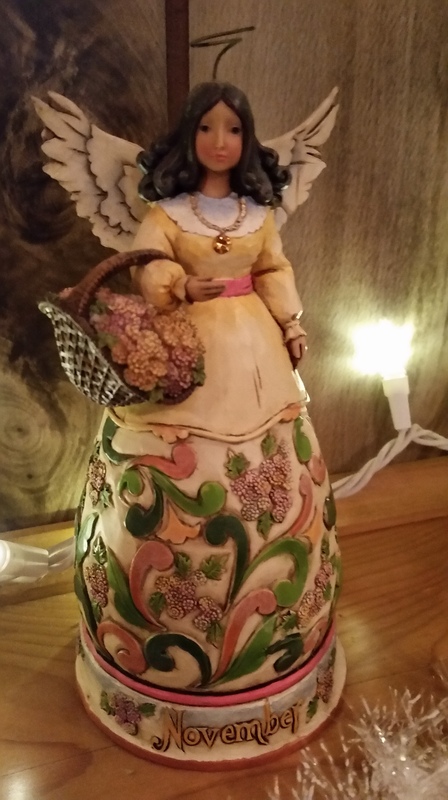 Another of my 11 angels perched on a shelf on the stairway landing is my “Birthday” angel. She was a gift from my little flock at St. Peter’s United Church of Christ after my first tenure of filling the pulpit of that little church in Punxsutawney. A delicate ceramic angel, she wears a necklace with my birthstone, topaz, on a chain around her neck. “November”—my birth month—borders the hem of her gown in raised letters across the bottom. And her halo—oh, my, one little bump and it’s askew. She reminds me of the happiness I get from serving my little flock and serving God in whatever way I can. My Birthday angel represents JOY. 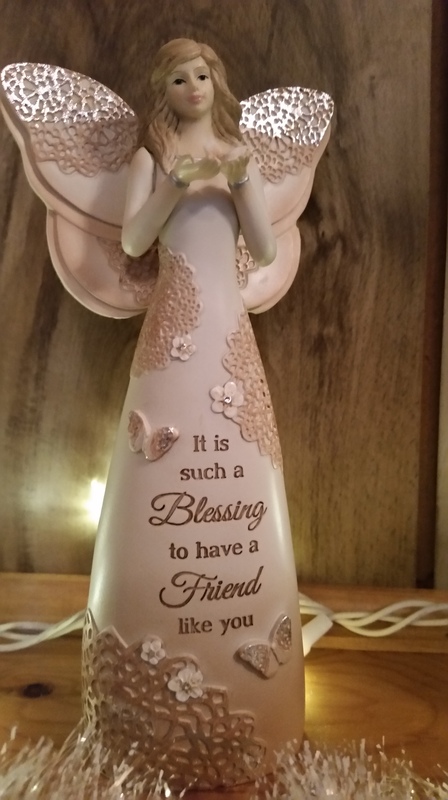 She is my “Friendship” angel, reminding me that friends are gifts from God. They remind us that we are never alone. Our Abba Father sends them to minster to us in times of need, to lend an ear and a helping hand, to give us hugs. Friends stand in the gap for us. A true friend brings a sense of stability and security to our hearts and lives. My Friendship angel represents PEACE. Look around. I’ll bet you have a few angels watching over you, too. Thank you, Father, for sending Your angels to minister to and watch over me and those I love. Amen.